BluRip is a lightweight and portable video conversion tool designed for creating MKV files from BluRay items. It primarily address users with some background in video conversion apps. The program is pretty low-demanding concerning the CPU and system memory, has a good response time, and takes a decent amount of time to finish a conversion task. However, BluRip has not been updated for a long time. In the download page of videohelp.com, BluRip says "NO LONGER DEVELOPED". So if you are the lover of BluRip and often decrypt Blu-ray, you need to get an alternative to Blu-Rip on Windows. Since BluRip supports to rip Blu-ray to a file with multiple audio and subtitle tracks, it is hard to get a totally equivalent replacement of BluRip. Fortunately, after a deep online reseach, we discovered a multi-track Blu-ray ripping tool, which can decrypt Blu-ray on Windows 10 to MKV, MP4, MOV, AVI with multiple subtitle and audio tracks in lossless quality. Pavtube ByteCopy is a free-to-try Blu-ray ripping application for Windows that features simple and user-friendly tools and functionalities for all your video needs. It is designed to rip commercial BluRay movies as well as convert DVDs into MKV format with ease. It also features powerful BD decryption utilities enabling users to remove copy protections on all BluRay discs. Recently, it updated to version 4.9.0.0 with the supports of H.265 CUDA acceleration. After the upgrade, you can rip Blu-ray and DVD with ByteCopy at up to 30x ripping speed by H.264/H.265 codec. In this update, ByteCopy can decrypt Blu-ray the latest AACS, UOP, BD+, MKB V61, MKB V62. And its equivalent Mac version – Pavtube ByteCopy for Mac supports the newest 10.12 macOS Sierra and 10.11 El Capitan. 3. Reads Blu-ray discs protected with latest versions of AACS, BD+, MKB v61, MKB v62. 7. Fast conversion – converts as fast as your drive can read data. 8. No additional software is required for conversion or decryption. 9. 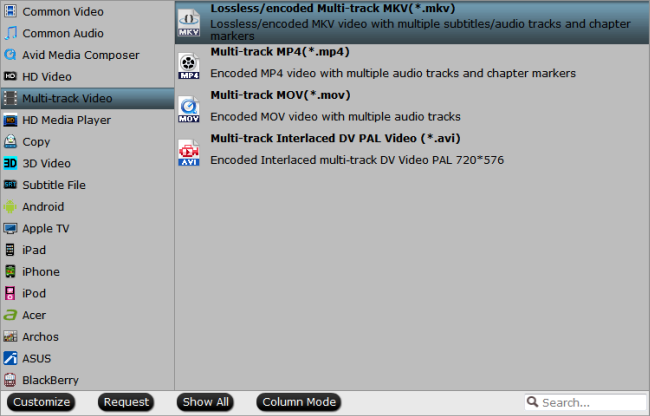 Convert BD/DVD to MP4 wrapper with multiple subtitle/audio tracks. 11. Rip Blu-ray/DVD to FLAC, WMA, MKV, MP3, etc audio files. How to Rip Blu-ray on Windows 10 with BluRip? Insert your Blu-ray into your computer’s hard disk and launch this Blu-ray converter. Then load the Blu-ray by clicking the button on top left corner. Click “Format” bar and select one of the formats you like. Or select a format depending on which device you want to watch the movie in. You can choose to rip Blu-ray to lossless MKV, which can preserve the original video quality of Blu-ray. There are two options: “Copy the entire disc” and “Directly Copy”. “Copy the entire disc” means copy the whole content of disc with the same structure with the original disc. “Directly Copy” means copy the selected movie title. Click the red button “Convert” on the main interface to start conversion from Blu-ray to MP4, MKVon Windows 10. It will pop up a conversion window indicating the conversion progress. See, it is easy to rip Blu-ray on Windows 10 with BluRip. This entry was posted in Alternative, Blu-ray, Blu-ray/DVD Ripping.